IT Modernization isn’t what you thought it was. It’s more than infrastructure updates and shiny new software. It reaches across the enterprise and requires an approach that focuses just as much on the building blocks as it does the solution. So, how do IT executives build their plan to prioritize and accommodate the legacy functions still driving the business and mission of their agencies while delivering next generation services? How are agencies approaching, and implementing, the myriad of complex modernization directives? What do agencies need to build, select, and consider in the background to make this modernization journey successful? Join us on April 24 at the City Club for not just another IT conversation. 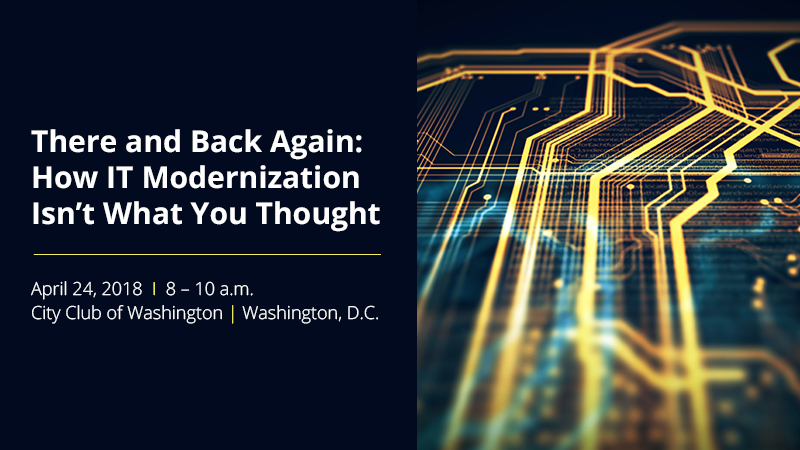 Attend this senior-level roundtable of agency and industry stakeholders to dive into the thorny topics surrounding IT modernization, look at real-life solutions that are working at some agencies, and be candid about how to sift through a total-perspective approach to modernization. To register please contact Caitlin Asher at casher@meritalk.com or 703-883-9000 ext. 143. For more information contact Caitlin Asher at casher@meritalk.com or 703-883-9000 ext. 143.